The book is a modest, charming, lighthearted gambol among the stacks. It serves up neither ideas nor theories but anecdotes about the joys of collecting and reading books. A terribly entertaining collection of personal essays about books, reading, language, and the endearing pathologies of those who love books. I absolutely loved this book and it’s one of my favorite reads this year. Fadiman originally wrote these essays for Civilization, the magazine of the Library of Congress. They chronicle her family’s love affair with books and words (the insufferable foursome who . . . still proofread menus together). Her parents (Clifton Fadiman and Annalee Whitmore Jacoby Fadiman) were both writers and she and her brother learned a lot about them from perusing their bookcases--their selves were on their shelves. I enjoyed each and every one of the 18 essays in this collection but my favorites were probably “Never Do That To A Book” (about book abuse) and “Secondhand Prose” (about used books). Fadiman’s family believed in “carnal,” as opposed to “courtly,” love of books. Hard use was a sign not of disrespect but of intimacy. She gives the example of her father, who, in order to reduce the weight of the paperbacks he read on airplanes, tore off the chapters he had competed and threw them in the trash. At the other extreme, Fadiman writes about her friend Clark who won’t let his wife raise the blinds until sundown, lest the bindings fade. He buys at least two copies of his favorite books, so that only one need be subjected to the stress of having its pages turned. On used books: When I was young I liked my books young as well. . . . In those days, just as I believed that age would buffet other people’s bodies but not my own, so I believed my paperbacks would last forever. I was wrong on both counts. As Fadiman got older, she began to enjoy the sensation of being a small link in a long chain of book owners. In a secondhand bookstore, each volume is one-of-a-kind, neither replaceable from a publisher’s warehouse nor visually identical to its original siblings, which have accreted individuality with every change of ownership. If I don’t buy the book now, I may never have another chance. And therefore, like Beecher, who believed the temptations of drink were paltry compared with the temptations of books, I am weak. This book has been recommended by so many here on LT I don't know why it took me so long to get to it. Simply a delightful book of essays about Fadiman's love of books and the role they've played in her life. And, surprise, it resonated with me just as much as any of the other wonderful books about books that I've read. Funny? Oh my yes. "Of course, if you are a compulsive proofreader yourself---and if you are, you know it, since for the afflicted it is a reflex no more avoidable than a sneeze---you are thinking something quite different: What a fine, public-spirited family are the Fadimans! How generous, in these slipshod times, to share their perspicacity with the unenlightened!" I don’t recall exactly when this book found me. I recall being married at the time; my 2nd wife and I were at a “Big Box” bookstore very late in the evening, and we had already been married a few years, but not as many as the book had been printed. So, the fact that I came upon a possibly eight-year-old First Edition hardcover in a store renowned for its high-volume, sell-them-or-send-them-back business model, was in itself rather remarkable and worth noting. I actually read Ex Libris: Confessions of a Common Reader for the first time in 2006. That would make this review the product of a Re-Reading, which coincidentally, is the subject of another one of this author’s books. Aside: Anne was the editor of that book, and wrote the Foreword for it. That in itself, was worth the price of the book. At the time I first read Ex Libris, I was not in the habit of writing reviews of any books, and once I did begin to record my opinions, I felt a pang of guilt, because this one is truly wonderful, and deserves better of me. I may as well get it out now and be done with it… Anne Fadiman has become my all-time favorite author. She may be usurped some day if I read anything by ~her~ favorite author, E. B. White, but I have so far successfully evaded all of his writings, ensuring Anne’s prime position as THE Preferred Author. Reading these essays, for me, is like I have just spent a day with a good friend that I hadn’t seen in a couple of years, and we were able to get caught up on how our lives were going. I assure you, this is not infatuation, but I’d like to sit down with her some time and talk over coffee. I’d even spring for the pastries. Ex Libris is a collection of eighteen essays, the longest of which span ten pages. It’s good, easy reading. It’s the kind of book you read in queue – at the bank, the supermarket, traffic lights… But it’s best read sitting in a comfortable seat because you really don’t want to stop once you get started. Each essay is a delight, and had plenty to muse over when you finish it – except for one. It’s nine pages long and has thirty-eight footnotes in it, which occupied the majority of the physical space therein. And whereas that was the point of the essay, it was nonetheless annoying as all get-out. But I forgive her, because I understand why she did it. Ex Libris is a book lover’s dream come true. It validates your reasons for wanting to read. It soothes the brow from the ravages of marginalia and dog-ears. It justifies cataloging and excessive purchasing – the bookends of the book, these two are probably my two favorite essays of the bunch. The rest are really just very well-written bits of great conversation, and I don’t think I could be more emphatic about recommending this book to everyone. There are so many things a writer can do with words, things that go beyond the basic, almost laconic straightforward meaning of the words. They can stir emotions, and suddenly writing can become wistful. They can hint and without ever saying anything challenging, create tension in the reader. It’s almost magic how they create something out of nothing. I’m thinking about this after finishing [Ex Libris], which receives raves from widely spread areas of the LibraryThing spectrum. It’s, of course, a book of essays on the theme of reading and books. I can’t quite place my skepticism, but while I wanted to read this, I could not imagine what could possible be so special...and it’s variety I’m thinking of. Readers tends to have reading personalities characterized by certain kinds and ways of reading. I have never met anyone that reads quite the way I do. So, I just assume a book about reading will cover other ground, something of peripheral interest to me personally...and cover it in a way that is only peripherally interesting to me. What this means other than that I have some kind of personal issues about reading another reader’s writing on reading, I haven’t figured out yet. Anyway, to Fadiman. Fadiman comes across to me as a highly skilled essay writer who can be great on occasion. She is exceptionally polished, and knows how to bring in many different things to link the reader to her points, and bring the reader in; and always one of those things has to do with some kind of literary anecdote. I have a Mary Englebreit card from a friend with the saying on the front of it (Books fall open, you fall in). I framed it and hung it on a bookcase, naturally. If it's a good book, when you fall into the book, parts of it fall into you, and you're not quite the same person when you leave it. Much of the time your 'to be read' list won't look the same after reading it, either. You'll find new treasures to add. And so it was when a few years ago my firstborn stumbled across a pretty little book titled Ex Libris, Reflections of a Common Reader. If you like books about books by people who love them, you'll love this one. If you like sweet stories of affectionate families, you'll love it. I liked it so much that I had to find a copy of my own, since my firstborn quite selfishly wrote her own name inside the cover the book she bought (she wishes she had done this from the beginning of her book ownership, as I never do remember with certainty who bought which book, and am always suspicious of claims that it wasn't me). Her father is Clifton Fadiman, the legendary critic, anthologist and former Book of the Month Club judge. Her mother, Time magazine correspondent Annalee Jacoby Fadiman, co-authored "Thunder Out of China" with Theodore White. Their apartment had room for 7,000 books and not much else. And I was embarrassed that I had never heard of either of them until I read their daughter's book. I was even more annoyed by this obvious gap in my common knowledge when I learned that my mother knew all of the above (at least about Mr. Fadiman) and could fill in my gaps with more. I wasn't annoyed that she could fill in the gaps, just frustrated that it hadn't been done before. A fantastic book! Especially for a book lover, it is a marvelous find. I read one little essay a day until they were all gone, then turned the tiny book over and over in my hands, like an empty chocolate box. And I don't even like essays that much! Anyone who is as obsessed with books, as so many of us are, will delight in this lovely compilation of stories about books, their personal meaning, how we collect them, why we collect them, how we do or don't share them and how we may have gained a love of reading. Some of my favorite essays include the author's comments regarding how, after joining her partner in marriage, years later it was decided to meld their books. Realizing that commitments can begin and then end, both book lovers did not want to give up their personal cache. What fun to read laugh out loud situations about who gets to give away their copy of a multiple edition and who decides how to categorize and shelf which are most important. Another essay, of which I can totally relate, discusses the fact that those who consume books like lovely pieces of chocolate, cannot help but become obsessive proofreaders, noting the smallest errors. We read menus and find typos. And, how very frustrating it is to read a lovely sentence and then discover the utter shock of a glaring spelling error. I laughed at this tale because a few days ago while at physical therapy I noticed many materials on the counter. Wham! I saw the proud statement that this practice is excellent in managing "pan!" Remembering that as an infant my granddaughter chewed the corners of all cards sent to her, I smiled when I learned that one of the reasons first editions of Alice in Wonderland are so difficult to find is because children seemed to like to eat the pages. "Promising to love each other for richer or for poorer, in sickness and in health—even promising to forsake all others—had been no problem, but it was a good thing the Book of Common Prayer didn't say anything about marrying our libraries and throwing out the duplicates. That would have been a far more solemn vow, one that would probably have caused the wedding to grind to a mortifying halt." I loved this. Adored it. It's been a long time since I finished a book and wanted to start all over again. I even read the acknowledgments to make it last longer. And when was the last time anyone said all that about a book of essays? This is a book about books. It's actually a collection of essays that Fadiman (daughter of the late famed scholar and book lover Clifton Fadiman) wrote for Civilization, the magazine of the Library of Congress. I'm not sure the magazine exists anymore (which is a shame), but for several years at least, Fadiman wrote a column there called "The Common Reader." We're talking about essays such as "Marrying Libraries," which is all about how Fadiman and her husband George Howe Colt -- after several years living together and several more as a married couple -- finally took the leap and merged their book collections. Before that they each had their books segregated on opposite walls in their NYC loft apartment. Now, combining libraries doesn't sound like such a big deal. The hardest decision would be what to do about duplicates. Do you keep both, or does that imply a lack of faith in the relationship and a potential for splitting the libraries apart again in the future? But no. The most difficult aspect for Fadiman and Colt appeared to be deciding whose classification system they would use. There's another essay on Fadiman's love of big words, otherwise known as sesquipedalians. (And yes, I already knew that. I just have trouble spelling it.) Her family used to collect them, trade them, and try to one up each other. I must add here that this is the first book I've read in a very long time where I actually needed to reach for the dictionary a couple of times. Though that might say more about what I'm reading than what Fadiman was writing. At the end of the day, I found myself really wanting to know Anne Fadiman. I wanted to compare book collections with her, and chat over dinner. I wanted to have a dinner party, invite her, and ask her to bring along half a dozen of her friends that she mentions in the book. These are people who don't mind when she calls them up and asks what titles they used to steal off their parents bookshelves when they were kids. They sounded like good folks. "It has long been my belief that everyone's library contains an Odd Shelf. On this shelf rests a small, mysterious corpus of volumes whose subject matter is completely unrelated to the rest of the library, yet which, upon closer inspection, reveals a good deal about its owner." 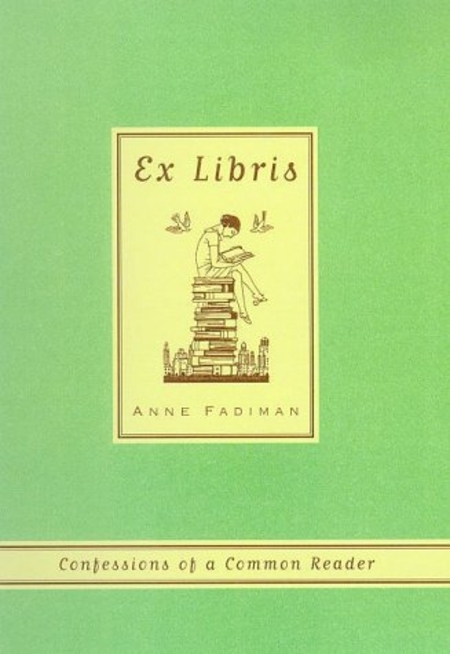 Ex Libris: Confessions of a Common Reader by Anne Fadiman is everything a booklover could want. She writes insightfully about Odd Shelfs (hers has 64 books about polar exploration), merging your library with a loved one's, predilections for constant proof-reading (including menus and store signs), the joy of long words like sesquipedalians (bonus points if you spot some redundancy there), and lots more in a slim, concise volume. She writes beautifully, and manages to make you want to spend time with her in a cafe in discursive palaver. Her family (parents, siblings, husband and children) are of her tribe, with the same love for books and words, and their appearances in the book are beautifully sketched. She's also self-deprecating, which she seems to have every reason not to be, and charms with admissions to things like her obsession with mail order catalogs. What a book about books! I loved this series of essays by bibliophile Anne Fadiman who regales with tales of her beginnings (when she played blocks with her father's pocket-sized twenty-two volume set of Trollope) to her family's weekly stand-off with the students on TV's GE College Bowl (Fadiman U. as they called themselves were beaten only by Brandeis and Colorado College). Anne's parents were both writers with extensive libraries (7,000 volumes!) and their child has been a collector from an early age. When Anne's husband presents her with a trip to a used book store where she purchases 19 pounds of used books, they haul them away to their New York loft to live with the several thousand pounds already in residence. Growing up in the Fadiman household (Anne has a brother, Kim) must have been fabulous. Dad quoted liberally from tomes in several languages and Mom had been a foreign correspondent before retiring to raise the children. Their collective mania for the printed word results in proofreading restaurant menus and challenging each other by unearthing new "sesquipedalians" (long words). She clearly considers it a magical childhood and her love for her parents permeates the book like a romance. Anne describes book owners as either "courtly lovers" who remove their bookmarks once a book is finished and return it to its proper place and "carnal lovers" who are likely to leave momentos and marginalia inside. Clearly the Fadimans belong in this camp and she admires a friend who, during a trip to the Yucatan, slammed the book shut whenever an interesting bug fell on a page, "amassing a bulging insectarium" amid the pages of "The Collected Stories and Poems of Edgar Allan Poe". "Nothing New Under the Sun" is an essay about plagiarism and the impossibility of being completely original; she fills the essay with footnotes, giving credit to everyone from Shakespeare to her husband for every line. My favorite: "Reference suggested by George on 11/14/96 as he was doing his back exercises on our living room floor." Obviously this book is a favorite among LTers but although Anne and I share much (including our first name, correctly spelled) I am not a book collector. I have access to a fantastic public library and am still astonished that I can go online and order a book and they'll send me an email to tell me when it's arrived. Last summer, when I got hooked on the Maisie Dobbs series, I took out three of the sequels and marveled anew that I was allowed to remove $75 worth of books ... on faith! It still fills me with optimism about our collective psyche that libraries still thrive, after all these years, on the honor system. Still, I do have a wall and a half of book shelves but I purchase them sparingly. Some paperbacks that I've purchased because of a too-long library wait have either remained on the shelves or been sent along to the library's used book sale. Bel Canto, Water for Elephants and The Thirteenth Tale made the cut; Girl with the Dragon Tattoo, The No. 1 Ladies' Detective Agency didn't. I enjoyed all these titles but the first group touched my heart. Other books I love so much that I purchased the hard cover versions after reading them: Remains of the Day, The Help, Major Pettigrew's Last Stand and many children's titles for future grandchildren. Dickens, Austen, Shakespeare and Steinbeck are all there but I could never touch the breadth of classics that Fadiman has read. In any case, the thought of owning every book I've ever read makes me think: clutter. I know that's the last thing that Fadiman and other "carnal lovers" of books would think but I'm afraid my thoughts go to: "What if there's a fire? What then?" So it's only my special books that stay on my shelves. Which is why I'm buying "Ex Libris" which had me laughing and nodding throughout despite my not having everything in common with this other Anne. (I might even - gasp! - write in the margins.) We do both love our fathers though and they've influenced us mightily. Hers was a brilliant intellectual. Mine? Not much of a reader but a great guy ... and a firefighter. Never do that to a Book, which explores the "proper" treatment of books, and highlighted one of my own personal quirks, the way in which I place a bookmark in order to know whether to resume reading on the right or left page. The His'er Problem, which discusses the importance of inclusive language in writing, and how writers in earlier eras "didn't really see women, and their language reflected and reinforced that blind spot." Insert a Carrot, celebrating the "compulsive proofreaders" among us. Yes, I'm one of them. My husband and I are prone to spotting grammatical errors on road signs. And I have found a kindred spirit in my friend Claudia, with whom I exchange raised eyebrows across the room when someone at work mixes up "averse" and "adverse". Secondhand Prose, celebrating the joys of used books. I hardly ever buy new anymore, having discovered both Paperbackswap.com and a wonderful small bookshop in a nearby college town (a great source for classics, cast off at the end of term). This slim volume is apt to spark a guilty flare of recognition in any compulsive reader. Fadiman - a bibliophile raised in a family of the same - uses different types of reading and attitudes towards books as fodder for her ruminations. The book can't entirely evade accusations of fussiness and elitism, but it's careful not to outstay its welcome. Few readers, if any, will identify with her predilections across all eighteen essays. They range from the joys of "you are there" reading - the act of reading a book in the same location it's set in - to the peculiar allure of catalogues and the ignominious compromise of joining marital book collections. However, the act of recognition itself, and the internal debate it will no doubt ignite about the types of reading *you* prefer, are certainly enjoyable. Fadiman is aware of the potential middle-brow snobbery that these fancies can entail, but cannot wholly avoid them. The book's appeal is undeniably limited to compulsive readers, and as a fully qualified member of that category, I all-too-easily recognised the unspoken, guiltily-delicious smugness lingering behind some of the sentences. Our love of books is comical and silly, Fadiman will complain, but there's an undeniable implication that it also makes us better readers, and perhaps better people. Maybe it's the New Critic lurking somewhere in me, but I prefer essays about reading that focus more closely on particular works and authors. Using a reading experience as leverage into more universal aspects of reading and writing, as typified by Michael Dirda's writing. Perhaps its my own biases, but there's something vaguely distasteful to me in making the experience of reading so intensively inward-looking. A great book about books. Two of my favorite essays in the book had to do with the way we love our books -- are we gentle with them or do we love them with abandon? and the ways of the compulsive proofreader. A book I would probably never have heard of if it hadn't been for LibraryThing and my (reading) life would have been the poorer as a result. This slim volume (only 130 pages) is a delightful collection of essays about books and Anne Fadiman's love for them covering topics as diverse as combining libraries on marriage, former British Prime Minister, Mr Gladstone's thoughts on how to organise a library, mail-order catalogues and an absolutely hilarious essay on plagiarism in the literary world. There isn't a single dud in this collection and I found it impossible to read this book without laughing out loud at several points and forcing my husband to listen to me read aloud large sections of each essay. I love books about books. I just can’t get enough. I love reading books about what other people love about books. I love knowing that there are other readers out there who love books as much as I do, who collect books as obsessively as I do, and whose houses are as packed with books as mine is. I love all of that. If you love that, too, then you will definitely enjoy Anne Fadiman’s collection of essays about her reading life. I feel a sort of kindred spirit in Anne. I kept seeing bits of myself in her—especially in the way she physically treats her books. To her, books are meant to be loved, and loved hard. They’re meant to be handled, cried over, eaten over, and written in. The Fadiman family believed in carnal love. To us, a book’s words were holy, but the paper, cloth cardboard, glue, thread, and ink that contained them were a mere vessel, and it was no sacrilege to treat them as wantonly as desire and pragmatism dictated. Hard use was a sign not of disrespect but of intimacy. To me, a sign of a good book is how close the cover is to falling off. I’ve never understood people who want to keep their books looking pristine, and I’ve always felt a little bit guilty about not being afraid to really manhandle my books. After reading Ex Libris, though, I feel affirmed. This little book about books is a real pleasure. Fadiman exudes wit and intelligence! This collection of essays was recommended a long time ago by a former member of one of my email lists. It had been on my TBR pile for a very long time. *sniff* I miss you, Kim. What this is is a collection of essays about books: reading them, shelving them, collecting them, etc. etc. It's a chronicle of a love affair with books. Almost every essay struck a chord with me: reading a car manual because there was nothing else to read (done that), playing word games as a child (yes), compulsive proof-reading of menus and signs (definitely), etc. I laughed aloud at the essay on plagiarism (no, not a funny topic, normally) with its overabundance of footnotes. And a light bulb went on when I read the essay on the difference between courtly and carnal love of books: I've always felt vaguely guilty for not keeping my books in pristine condition--I eat while reading, read in the bath, leave them lying around, and my best-loved books are all mostly falling apart from being read and re-read. Turns out I'm in good company. The only thing I had to overlook was what felt like a prejudice toward reading only classic literature. But honestly, I'd expected that. A book of essays about books is not likely to be written (or perhaps it's just not likely to be published) by an avid reader of contemporary genre fiction. This is one of my favorite books. The daughter of Clifton Fadiman can write! These are wonderful essays about life, family, and most importantly, about books & reading. All are interesting & written beautifully, and they also have a lot of warmth & humor. This is a book worth owning to be able to reread certain essays every once in a while. Without a doubt, this book of essays is well-written, witty, and insightful. I laughed out loud at numerous places, and my smile made frequent appearances. I loved the essay on plagiarism and the one on catalogs. However, there was something a bit off-putting about it. Despite her prodigious vocabulary, I'm not quite sure the author knows what the word "common" means. Her experience with books, being the scion of well-off two parents from the New York literary elite and the wife of another member, is hardly that of the average person. The title sets an expectation of relatable material for all bibliophiles, but this simply is not the case.